On behalf of admin of JML Law, A Professional Law Corporation posted in Car Accident on Friday, May 25 2018. Yes, even using your phone at a red light counts. We are used to seeing studies that show that even a few seconds of using your phone while driving can result in catastrophic injuries or even death. But a new study by Zendrive has just revealed the disturbing truth about distracted driving in Los Angeles, California, and all across the United States. “Turns out, nearly a third of all American drivers are guilty of looking at their phone instead of the road while driving,” our Los Angeles car accident attorney at the JML Law summarizes the findings of the study. The study conducted by Zendrive, which analyzed driving habits of 3 million anonymous drivers over a 3-month period, revealed that U.S. drivers are using cellphones while driving over 100 times more than previously estimated. According to previous estimations by the National Highway Traffic Safety Administration (NHTSA), an insignificant 600,000 drivers in the U.S. were thought to be looking at their phones instead of the road while driving. The study by Zendrive, meanwhile, puts that number at nearly 70 million drivers. The distracted driving study analyzed data of actual cell phone usage while driving instead of relying on observations or survey results. More than 3 million anonymous drivers were analyzed as part of the large-scale study. Over a 3-month period, the study looked at more than 570 million trips, in which the participants drove over 5.6 billion miles total. The results of the study, which analyzed trips between December 2016 and February 2017, shocked even our best car accident attorneys in California at the JML Law. The study showed that drivers got distracted by their phone during 88% of all trips. That is the equivalent of 600 million distracted driving trips every day if converted to the entire nation. More disturbingly, the study showed that drivers averaged 3.5 minutes spent looking on their phones instead of the road during an hour-long trip. Our Los Angeles car accident lawyer reminds readers that distracted driving increased the risk of a collision by more than 20 times, which makes the findings of this study even more alarming. Is using cellphones while driving prohibited by law? In addition to the analysis of actual distracted driving in California and all across the United States, Zendrive’s study also focused on the effectiveness of federal and state laws banning the use of hand-held phones. While the hand-held phone bans are intended to reduce the amount of time drivers spend looking at their cellphones instead of the road, studies show that these laws are not always working. Zendrive’s study shows that out of all cities across the United States, Los Angeles ranked as the most distracted city. And this is not surprising considering how prevalent car accidents caused by distracted driving are in Los Angeles and all across California. 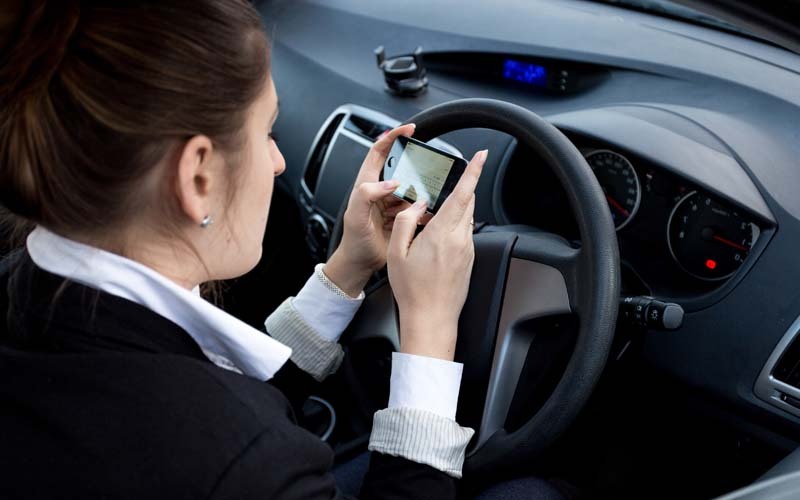 Our Los Angeles car accident attorney at the JML Law reminds readers that current state laws in California prohibit holding an electronic device while driving as a primary offense. Even though these laws are rather strict, 50,000 citations are issued to California drivers for using their cellphones while driving each year. And texting is not the only problem to blame, as an increasing number of drivers get distracted by their phones to take selfies and even watch videos while driving, which puts the driver, his/her occupants of the car, other motorists and pedestrians at a great risk of a devastating car accident. Have you been involved in a car accident involving distracted driving? Do not hesitate to consult our best car accident lawyers in Los Angeles. Contact the JML Law to get a free consultation today. Call our offices at 818-610-8800 or send us an email.